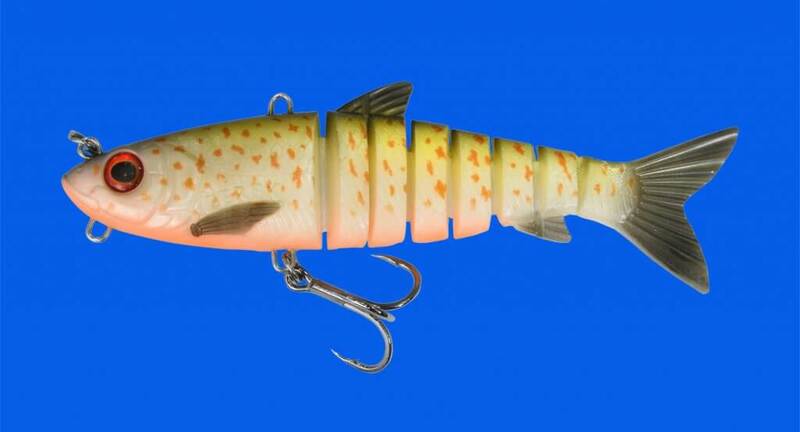 The Zerek Live Swimbait takes the famous Live Mullet body profile to the next level. It uses the same concept as the widely acclaimed Live Shrimp – to emulate natural prey movements to trigger strikes. The segmented TPE (thermoplastic) body is held together with a Kevlar webbing, giving superior strength and freedom of movement. The main body section hides an ingeniously designed one-piece wire frame that connects the tow point to the hook hanger, giving even more strength. The wire frame also has additional hangers – two on top for attaching a spinnerbait arm or extra hooks, and a hanger underneath for chin weights such as the Mustad Fastach Football Weights and the traditional hook hanger. Easily workable with a straight retrieve, the life-like 3D eyes and detailed finishes (natural and attractor patterns) make the 8” Zerek Live Swimbait very effective on barra, Murray cod, mulloway and more. Available in 12 colours, the Live Swimbait is designed to sink in freshwater at the rate of 1ft per second, allowing anglers to target suspending fish, thermoclines or bait schools easily.